My 41st entry in Amy Johnson Crow’s “52 Ancestors in 52 Weeks family history blogging challenge. I am still playing catch up, from being quite sick much of this year. My 41st ancestor is my husband Jeff’s 3rd great grandmother, Margaret Gann (1830-1919). Margaret was married to Miles Washington Harless (1826-1891), and was mother to Jeff’s 2nd great grandfather Leonard Jackson Harless (1858-1946). This is the family that emigrated from Missouri to California via the old emigrant road, traveling over Ebbetts Pass in the high Sierras in the summer of 1858 when Leonard was an infant. Following our stop in French Camp (aka Castoria) to check out the locality where Margaret and Miles lived at the time of the 1860 US Census, Jeff and I headed back up Highway 4 to our next Gann-Harless family history stop, in search of 26 Mile House in Stanislaus County. By 1870 the family had relocated from French Camp, backtracking east to North Township in Stanislaus County, which was served by the 26 Mile House post office. 1870 US Census, North Township, Stanislaus County, 26 Mile House Post Office. Courtesy of Ancestry.com. The family is recorded on pages one and two of the census, taken 27 July 1870. When I first came across this census, I couldn’t find a modern day town or community named North Township in that area or good references to a town or city that previously went by that name. The term “26 Mile House” is a bit more distinct though, so I started searching for references to that location. All hits described it as a post office and stage coach stop, located 26 miles east of Stockton along the Stockton to Sonora stage coach route. That 26 Mile House post office referenced on the census had just been established on 2 May 1870 (less than 3 months prior), when the settlement was at its peak. It was relocated to the nearby settlement of 28 Mile House (now Eugene) in 1894, and the to the town of Farmington (which still exists today) in 1930. Courtesy of the Stanislaus Historical Quarterly and the California State University Stanislaus University Library. 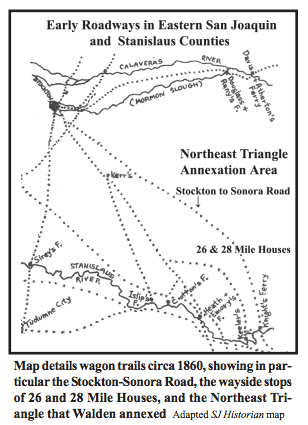 The Autumn 2012 issue of the Stanislaus Historical Quarterly explains that this area, known as the Northeast Triangle Annexation Area was annexed by Stanislaus County in 1860 from San Joaquin County. Newly named North Township (our census district) used to be Emory Township prior to the annexation, and was also referred to as North Precinct. This annexed area extended north, including one mile of the Calaveras River. At 26 Mile House and 28 Mile House, “stage line horses were changed, and travelers rested, ate, and refreshed themselves” (pg. 417). In the mid 1890s, a fire destroyed the roadhouse and tavern at 26 Mile House, causing residents and businesses — especially after losing the post office too — to abandon the settlement and move to 28 Mile House. 28 Mile House, located at the junction of the Stockton-Sonora Road and Milton Road, was founded in 1850 and changed its name to Eugene in 1890 (pg. 418). This information helps put the 1870 residence of our Harless ancestors in context. While the census record does not record an actual address to pinpoint the exact location of their home, it does tell us that they lived in this newly annexed Northeast Triangle Annexation Area. And a check on Google Maps shows that Sonora Road, 26 Mile Road, 28 Mile Road, Milton Road, and the town of Farmington all still exist. So, that was enough incentive for us! 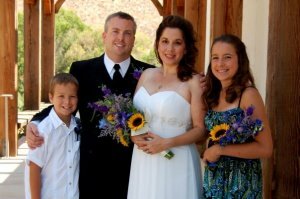 These spots got added on to our Harless family history San Joaquin Valley road trip itinerary. The next stops after French Camp. Farmington, California. Population 262. We pulled off here (Highway 4 and Jct. 6), figuring that our Harless ancestors might have lived near here, had friends here, or did business here. The Farmington general store. Might this have been here in 1870? Littlejohn’s Creek on East Sonora Road. Was this a view experienced by our ancestors? Alright. Dead end. Guess I should have zoomed in more on Google Maps before sending Hubby in this direction. East Sonora Road at Farmington Lake. East Sonora Road does NOT go all the way through anymore, it is cut in half by the lake. Heading south on Henry Road to get around Farmington Lake. I imagine this scenic agricultural setting is what our Harless ancestors saw. Not what we were expecting! However, Hubby had a blast driving our little rental RV down this bumpy roller coaster of a road. Our Harless ancestors raised livestock somewhere in this general area. We made it! The infamous 26 Mile Road. Junction at Carter Road. Heading north on 26 Mile Road. Did our Harless ancestors live near here? A farm along East Sonora Road. Not much else out here on East Sonora Road, once the main stage coach road connecting Stockton to Sonora. East Sonora Road at 28 Mile Road. Site of the former 28 Mile House stage stop and post office. A cool old school, founded 1892. Our Harless ancestors had moved out of the area by this time. The Milton Road junction with Highway 4. Again, like French Camp, it was a bit disappointing to not find much in the way of 1870s-era historical structures still standing (well, to be fair, not even contemporary structures). But driving through this area still helped us get a feel for what life may have been like for our Harless ancestors at that time. Unlike French Camp, though, we had no expectations ahead of time (from a big fancy chamber of commerce sign) that there would even be anything here.